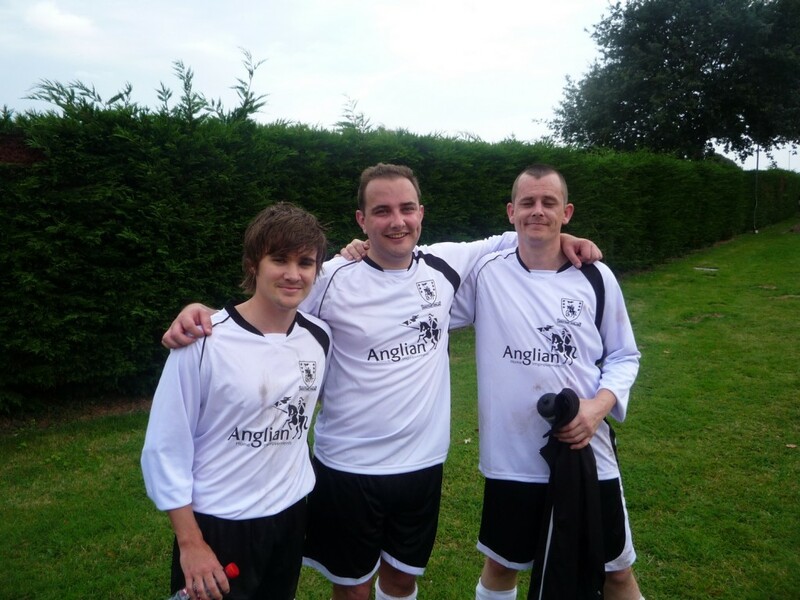 Saturday 10th September marked the opening game of the season for the Anglian Knights FC, who were hoping to put the pre-season defeats behind them and get off to a flying start against Mousehold Reserves. The game kicked off with some immediate pressure from the Knights as they passed the ball well amongst themselves, winning a free-kick in the opposition half. Craig Kiddell whipped the ball into the box dipping over the defence, but it could not be reached by any Anglian players. Mousehold played a lot of long balls forward, and with 2 big strikers it caused a few issues for the Anglian defence, but they stood strong and forced a few long range efforts. Most didn’t trouble the keeper too much except one that bounced awkwardly in front of Joe Young (normally a defender) who denied a goal with his face to give a corner. A great save either way! Chances were few and far between, with Anglian continuing to play short, quick passes, Mousehold Reserves were getting frustrated giving away free-kicks often. Craig Kiddell kept delivering some wonder balls into the box, but the Mousehold goalkeeper did well to intercept before an Anglian player could get a foot in. The game was looking like there would be no goals until about 35 minutes in, when good work by Adam Wallace and Mark Cooke on the right allowed the game to develop, Cooke battled well to keep hold of the ball despite being on the floor. He laid the ball off to fellow centre midfielder Louie Watts, who struck the ball from the edge of the penalty area, curling beautifully into the bottom left corner of the goal. 1-0. The Knights kept the pressure up until half time, but not creating many more chances to score. Leon Raby had a left footed effort from the edge of the area curl wide, and Jake Robinson came close to poking the ball round the outstretched keeper after a great through ball, but they could not beat the keeper again. Louie Watts had another effort from range, but this time it curled horribly wide. The second half started with Mousehold on the front foot, pushing what had been a solid defence in the first half back deep into their own half. Kierstan Foreman, Leroy Sandell, Ian Probert and Kirk Lanckmans had been a brute force at the back, but as Mousehold continued to attack hard chances started appearing for them. Mousehold finally got a break after about 60 minutes, when a cross into the near post was met by a Mousehold head and flicked into the back of the net. 1-1. The Knights tried to pick themselves back up with some short sharp passing, but they were closed down quickly, and again hit with long balls forward testing the pace and strength of the back four who coped brilliantly. 70 minutes came and a darting run from a Mousehold midfielder split the defence and an unfortunate slip by Mark Cooke left the midfielder in on goal, who made no mistake in burying the ball in the top right hand corner. 1-2. The pressure was on for Anglian who had played superbly in the first half. They now forced the Mousehold defence into their own half, with great passes out wide and Adam Wallace working particularly hard to skin their left back. Despite his best efforts a goal scoring gap did not appear until a great through ball was collected in the penalty area by Mark Escott, but his shot was scuffed wide. The Mousehold defence stood strong, winning balls in the air and whacking the ball clear. This tactic turned into a bizarre goal on 85 minutes when their number 9 smashed a ball from the half way line, which dipped ferociously, beating the stand in goalkeeper to make it 1-3. This goal against the run of play put even more pressure on the boys in white who then continued to pile on the pressure, with David Downes and Craig Kiddell whipping balls into the penalty box, but none prevailed. Final score Anglian 1-3 Mousehold. First game of the new season, unseen opposition, a new group of lads to gel together. Result amazing! This game hopefully sends a message out to the rest of the league that the Anglian Knights are not a team that are there to make up the numbers. I was very impressed by every one playing in the mighty black and white on Saturday. I think we went into the game with a little apprehension as Mousehold had already played two games, drawing 3-3 and then winning 7-0 last week, so had already shown they were a free scoring team. However, my team selection would hopefully stem some of there ability to dominate the game and this was justified with an amazing first half display. Fluent passing and communication to control the tempo on the pitch, which ultimately resulted in a cracking effort from Louie Watts nestling into the back of the net, 1-0 Anglian. Mousehold won the second half with two well worked goals and a hit and hope third. However, the work rate from Anglian in the second half did get tested and this was down to the fitness, which will most definitely improve as long as we maximise every training opportunity. I would like to make a special mention to a couple of the lads that I was very impressed with. Firstly, Kierstan Foreman. I hadn’t seen much of Kierstan in regards to ability, however, Kierstan controlled the left hand side allowing Craig Kiddell to venture forward for the attacking option. Secondly, Kirk Lanckmans. Kirk had shown some great work rate during the short training sessions we had, but having to do that for 90 minutes was a concern, but my hat comes off to you, your work rate and continued efforts through out the game showed I made the right choice with starting you at right back. Everyone played fantastically and as a whole we put in a sterling start to the year. Overall guys, extremely impressive start to a long season, some great individual performances and a brilliant team attitude, lets build on it and go into Saturdays game with the same intensity we had in the first half, but keep it for the whole 90 minutes and we will come out of the game with the first of many wins !